Hi everyone, and thanks for having me Misha! I wrote a couple of novellas about six months apart. I love them! I love the characters. I think they’re great books. A lot of people agree. Some won’t, and that’s okay. The only thing that really matters is they’re mine. 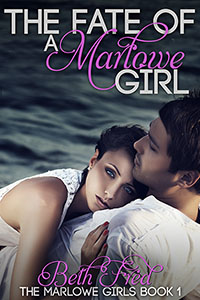 I wrote The Fate of A Marlowe Girl seven months into a problem pregnancy. It’s a short story, and because I was so sick it took a whole month to write it. I wrote the second book while taking care of an infant. I love my little ELF, but writing with a baby in your arms, or while rocking a stroller with your foot isn’t easy. So for obvious reasons, these books are special to me. But they’re chattel to others, so I’m here to talk about pirates and trolls in our modern world. I uploaded the first book to smashwords a few weeks before its planned release date. I only left it live long enough to download a copy and see how the formatting was working out. But in that amount of time I sold a copy. Yay! No one knew it was available—and really it wasn’t. I unpublished it until closer to the release date—and still it sold a copy. A pirate bought it. I know because months later I put its original title into a search engine to see how it was doing. The first pop-up was a site for free ebooks. It had more illegal downloads than legal downloads! I didn’t get upset. The title and cover were going to change anyhow, so the pirates wouldn’t have the new version. I planned to make the first book free when the second released, and I wouldn’t release the second anywhere but Amazon. No real loss. Maybe some people who really liked the first book would buy the second. I enrolled in Kindle Select, because I was only going to use Amazon, the cyber bully, to prevent pirating. The same thing happened again and I feel like Amazon encouraged it! Amazon is refunding ebooks with no questions asked for seven days. I uploaded the book weeks before its release date to create buy links for my blog tour host. That night I sold two copies of the second book and one of the first. All three were refunded within hours. The next morning both books were on dozens of websites for free. I was furious and heartbroken! Not only had my work been pirated again, but Amazon contributed to it. And the pirates got it for free. This is happening a lot. Not just to me. You can sign a petition against Amazon’s refund policy here. Then I got stupid. I tracked the pirate to find out who stole my work. I found her bragging about how good she was in a forum. She saw a fb post where authors were complaining they knew their books had been pirated. Furious, I pasted the screenshot. That’s when I started getting trolled. 1 star reviews started popping up on goodreads from places where the book wasn’t legally available. In two days time they had my 4.5 star rating down to the low 3s. So in this modern world, we have pirates and trolls, but there are unfortunately no white knights. If you’re a writer your book most likely will be pirated. Do a cost benefit analysis. If you’re self-published is it worth it you to pay for Muso? Until you have several books out, it probably isn’t. But once you are making a steady income from your writing, that’s a good investment. They’ll get your book removed from illegal sites for you. If you’re going through a publisher to make publish an ebook make sure they have a legal team, or use Muso. Other than that roll with it. There isn’t much you can do about it anyhow, and most of the people who were going to buy your book won’t download illegal copies. It’s not fair, but it’s life.